Out of nine translations the only EU languages are Romanian and Polish (I think - correct me if I'm wrong) - though apparently if you call the freephone number this can be rectified. Well, their downloadable Code of Services PDF says it's the BBC, so this is taxpayers money, yet again! I have emailed them to ask who is funding all this. I will let you know if I get a reply. Thanks Sue, indeed it has the BBC logo plastered all over the front of the envelope. 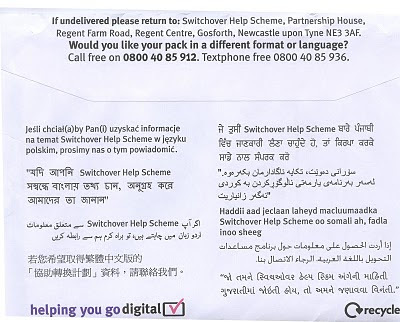 One wonders if you need a polish translation on the envelope how you've coped with watching Eastenders on analogue tv. Hardly Anybody Gives A Monkey’s?